It used to be that a dental bridge was the best tooth replacement option available, now that is no longer the case. Bridges are still better than removable prosthetics but they are lacking when compared to a more modern option like dental implants. Let's take a look at the traditional bridge. When you lose one tooth or maybe a few in a row, a bridge offers you a permanent way to replace those teeth. How does it accomplish this? A bridge needs two healthy teeth to act as anchors for either side of the bridge. 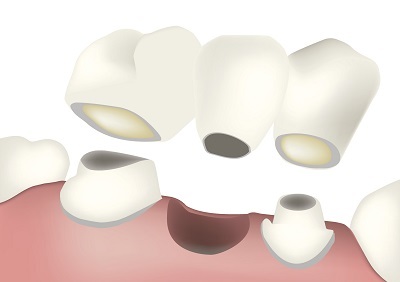 These teeth are prepared to receive the bridge by removing a good portion of the enamel from the tooth so that the bridge can fit over them and be set in place permanently. What Makes Them Less Than Appealing Today? So you have a traditional bridge placed. The results? Two perfectly healthy teeth have to be significantly altered in a way that makes them unable to be a viable tooth without some sort of onlay fitted over them. Not ideal! Today we have the option of dental implants. Dental implants can replace one tooth, or act as an anchor for a bridge, and even can support a permanently placed full arch of teeth with the help of more implants. Right off the bat dental implants are an improvement because they allow you to forgo altering a healthy tooth in order to have a replacement put in. Dental implants also offer a huge array of benefits that end up keeping your mouth in great shape. They promote continued bone growth in the jaw, which prevents future tooth loss. Dental implants are able to last a lifetime and give you all the benefits that a real tooth would. Please contact us if you have any questions about dental bridges.